Google Calendar is a great tool for helping faculty and students stay organized. More powerful and flexible than your Groupwise or Blackboard calendar tool, calendars created with Google’s tools are meant for collaboration and communication. What sets Google Calendars apart from other planning and scheduling tools is its ease of use, its integration with other Google productivity tools, and that it can be accessed on just about any computer or mobile device. How Do I Get Google Calendar? To get started with using any Google tool, you will first need to create your own free Google Gmail account. This is easily done by going to https://accounts.google.com/SignUp. Once you have your account and are logged in, click the “Calendar” link that appears at the top of your personal Google page. 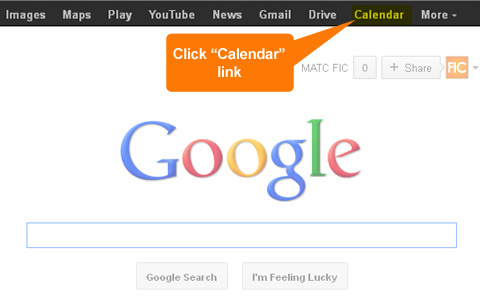 To access the Google Calendar tool, log into your Google account and click the "Calendar" link at the top of the page. How Do I Create New Calendars and Events? Google Calendar automatically gives you two calendars to work with, a personal calendar and a calendar of US holidays. But you can create additional calendars to organize and manage the different aspects of your work and professional life. For example, if you teach multiple classes each semester, you could create a separate calendar of events for each class. You could then view each calendar separately or layered together. After you select a particular calendar, adding an event to it is as easy as clicking on a date on the calendar and completing a simple scheduling form. Google Calendars integrates with Google Docs and Gmail. When you create an event on your calendar, you have the option of attaching documents from your computer or Google Drive to the entry’s event details. This can be done by either clicking the “Edit Event” link you see either when creating the event or reviewing the event’s details. It is important to remember that attached documents are accessed by clicking on the calendar event and viewing the event’s details. You can send event invitations to the Gmail accounts of people who you would like to attend. When someone accepts your invitation, the calendar with update to tell you who has given their RSVP. Automated Gmail and pop-up text alerts can be set to remind all participants to attend the event within days, hours, or minutes of it beginning. How Do I Share a Whole Calendar? In addition to sharing calendar information by sending invitations, you can grant students and colleagues access to your calendars through assigning permissions and assigning the level of access you would like them to have. For example, if you created a course schedule or homework calendar that you wanted to share with your students, you could explicitly assign each student view-only permission using their student MATC Gmail addresses (available through your Blackboard course roster). The calendar would be added to each student’s personal Google Calendar page tied with their account. When shared with groups of people and assigning full editing and sharing capabilities, a Google Calendar can become an excellent planning and project management tool. For example, a group calendar could be used by a department to keep track of everyone’s teaching schedules, meeting obligations, and critical deadlines at a glance. Each member of the department would use their own Gmail account to update and manage the calendar. In addition to the methods mentioned above, you could embed the full Google Calendar directly into your Blackboard course for easy integration with your other course materials. When you view your Google Calendar’s settings page, you will see options for generating customized embed code that you can copy and paste into a Blackboard item when in HTML source mode. To embed a Google Calendar in a Blackboard content area page, use the Build menu to create an Item. When creating the Item, click the "HTML Source Mode" button. Then paste the embed code in the text box and click "Submit". In summary, Google Calendars are a great tool for organizing your time and sharing scheduling information with others. Instructors can use it to communicate their teaching schedules, create course itineraries, and manage collaborative projects with other faculty members. Students can use Google Calendars to keep themselves organized and prepared for classes.